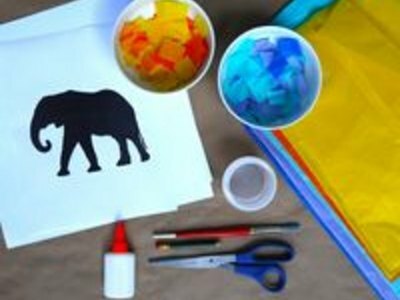 Tissue paper collage art is easy to make and a fun kid friendly activity perfect for lazy afternoons, birthday parties or school projects. 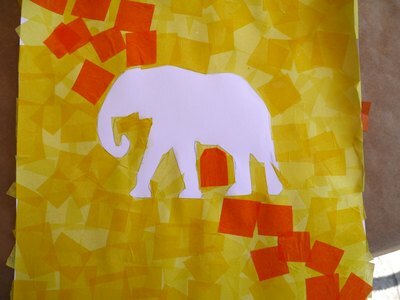 With tissue paper and white glue it's easy make collage art. Please see the last slide for an itemized list of tools and materials. Begin by deciding on a project. If you're looking for something fun and fairly easy, animals are a good fit for beginners or children. 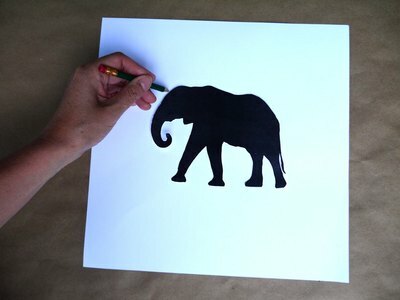 You can trace one out of a book, use a stencil or print clip art from the computer. 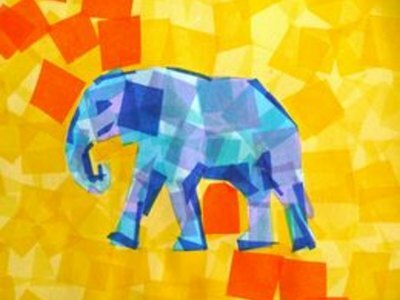 You can print the elephant in this article from the link in the last slide. Next, decide on a color theme. A good idea is to pick contrasting colors, one for your animal and one for your background. 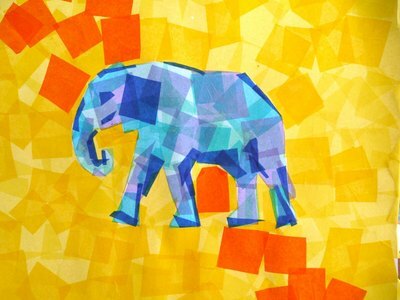 In this example, warm yellows and oranges make up the background, and cool blues form the elephant. Cut tissue into roughly 1 inch squares. Six colors are shown here. About 1/2 a sheet of each color are needed to cover a 12 by 12 inch paper. Cut clipart out with scissors. Place the cut-out on white cardstock and trace, transfering the image to the cardstock. 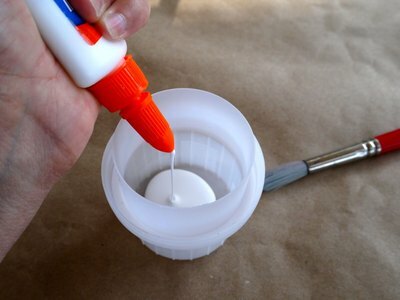 Mix a 1/2 white glue and 1/2 water in a mixing cup. Three Tbsp of each will make enough glaze to cover a 12 by 12 inch paper. Begin with the background. 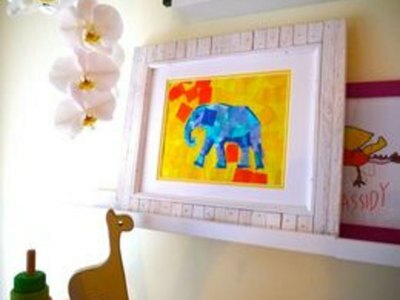 Paint a small amount of cardstock with glaze and place a square of tissue paper down. Immediately add more glaze over top. Add more tissue squares to cover the white cardstock, overlapping them as you go. Place the edges of the square tissue right along the edge of your drawing. In tight places you can trim tissue to fit. To acquire the yellow background seen here, mix both light and dark yellows and place them at random. Then, add darker colors to make a pattern. 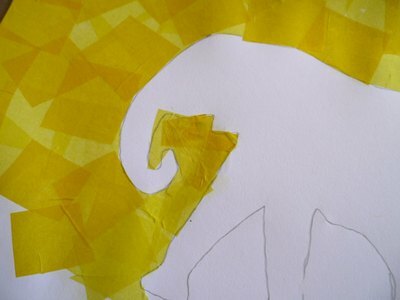 Cover the elephant the same way as the background. Clip smaller pieces to fit in tight areas, such as the trunk and legs. 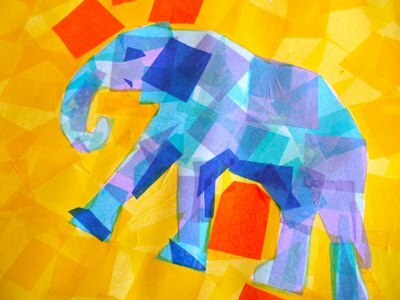 A light blue, a light turquoise blue and a light lavender cover the elephant in this example. Trim longer, smaller bits of tissue in a darker tone to create shadows and details. Place under the belly, under the trunk, on the backside of the legs and to form the ears and eyes.